The incumbent, Joko "Jokowi" Widodo, made a brief trip to Mecca in Saudi Arabia, where he performed the umrah, or minor haj, with his wife and two sons, while his rival, Prabowo Subianto, made a pilgrimage to the grave of his father, Sumitro Djojohadikusumo, a renowned economist. The pair had squared off in five nationally televised debates, with most political pundits judging the contest about even, although Prabowo remains up to 20 percentage points behind in opinion polls. The Prabowo camp has already complained about "ghost voters" and the potential for rigging. But National Police Chief Gen. Tito Karnavian told the Jakarta Post he had not received reports about incidents impeding the electoral process. "Two days to go; we are convinced that we have security measures under control," he said. "Theoretically the system could be susceptible to people voting multiple times, but in practice it really hasn't been a problem in past polls and I really wouldn't expect it to be so this year," he said. O'Rourke said Prabowo, following his defeat to Jokowi at elections in 2013, had launched a legal campaign challenging the result when he lost by six percent of the overall vote. "I think it's an attempt by the Prabowo campaign to justify a basis for making an electoral dispute, but I think that's only going to be feasible for them if the margin of victory for Widodo is more narrow than expected," he said. Surveys indicate a large number will not turn out, known as "golput," a term that first emerged in 1971 from protesting students opposed to an election they considered undemocratic. Now the term has been adopted to describe voters who abstain or deliberately spoil their ballots. According to the S. Rajaratnam School of International Studies, sexual violence against women rose 76 percent from 2016 to 2017, while, as president, he has not been shy in pushing a more conservative brand of Islam. Nevertheless, he remains the favorite to win a second term. He will have to stand down in 2024 as mandated by the constitution. 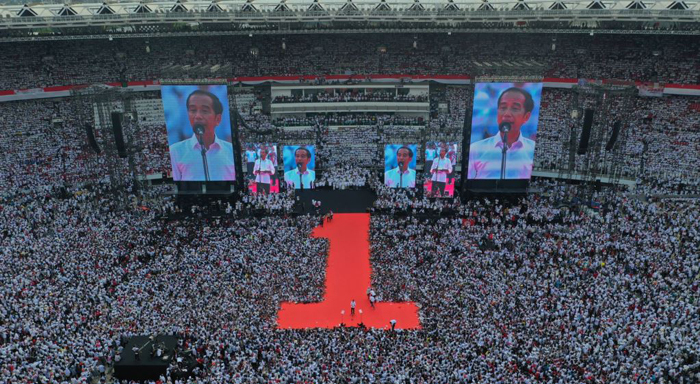 Analysts expect a more confident and conservative Jokowi during the coming five years. Marcus Mietzner, an Indonesian specialist and senior fellow with Australian National University, said he expected Indonesia to emerge as a more socially conservative and a "religiously marked" society from Jokowi's second term, assuming he wins. "I think he is a very careful politician, a very cautious politician, he will want to continue balancing political forces," he said. "He will continue to integrate retired military officers into his state apparatus as he will integrate more pious Muslim figures like his vice president." However, others have said he was pushed into accepting Ma'ruf as part of a broader political play and positioning for the next election in 2024. But on the streets of the capital those arguments remain in the distant future. As the political signs came down, there was no shortage of voters on the streets, who were preparing to vote Wednesday, a national holiday. "I like elections. I want Indonesia to be a democracy, a democracy like the United States, like Canada, Australia and in Europe," Masi, a 26-year-old computer programmer said. "Indonesia is maturing," he added.